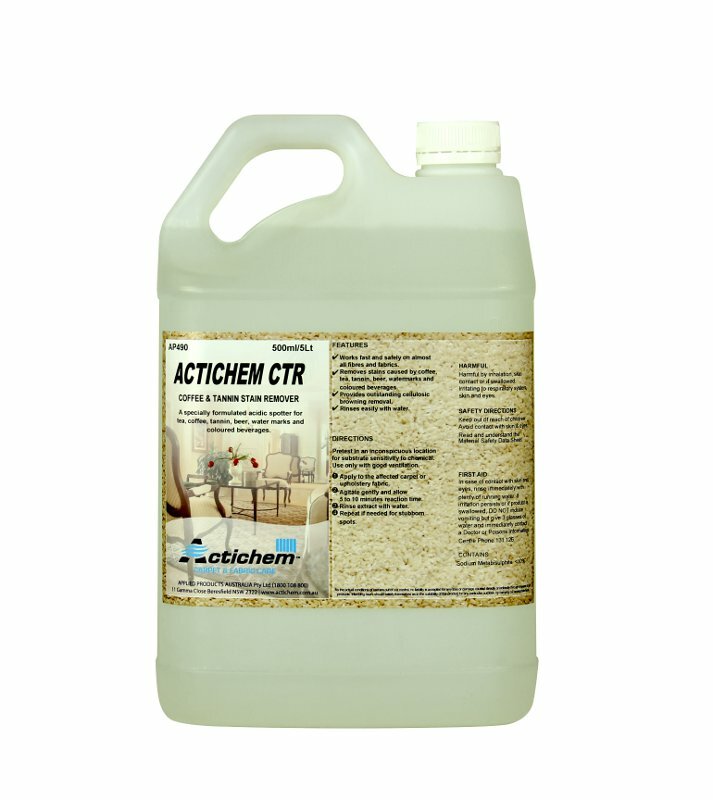 Actichem’s unique range of professional spotting products, has been developed over an extensive period of time, using the most advanced, up-to-date chemical technology available. 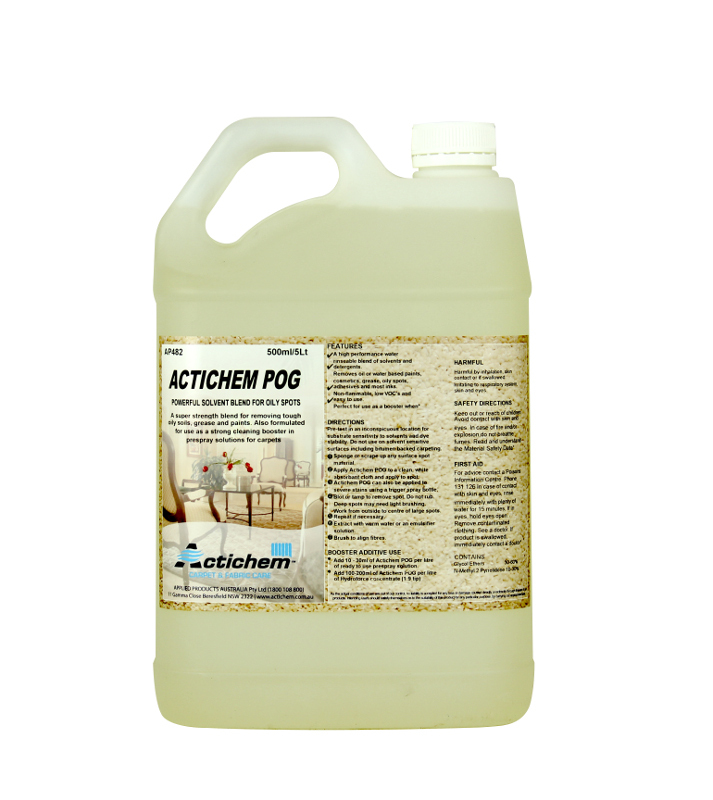 The Actichem range of spotters includes on-sell products that will leave your clients with a lasting memory, as well as a solution to keep their carpet looking great…till your next visit. Actichem Orange Solvent is a super strength solvent spotter for removing the toughest chewing gum, bitumen, greasy deposits, paint & ink. It is excellent for removal of tough greasy build-ups and oils. It rinses out with water or extraction detergent. Creates a pleasant orange citrus during use. It will chemically breaks down gums, bitumen, tar, paints, lacquers and many inks. And it works super fast saving you time. Available in 500 ml, 5 and 20 liters. 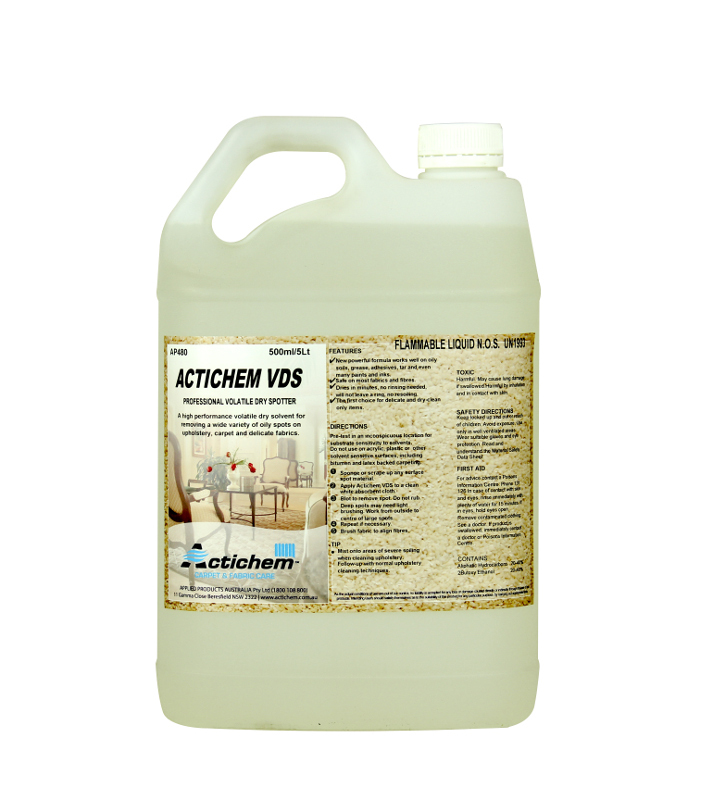 Actichem's VDS is a high performance volatile dry solvent for removing a wide variety of oily spots on upholstery, carpet and delicate fabrics. It is safe on most fabrics and fibres. It dries in minute, no rinsing needed, will not leave a ring, no resoiling. The first choice for delicate and dry-clean only items. It is new powerful formula works well on oily soils, grease, adhesives, tar and even many paints and inks. Available in 500ml, 5 and 20 litres. Actichem's AP482 ACTICHEM POG is a super strength blend of powerful polar and non-polar solvents for removing tough oily soils, grease and paints. 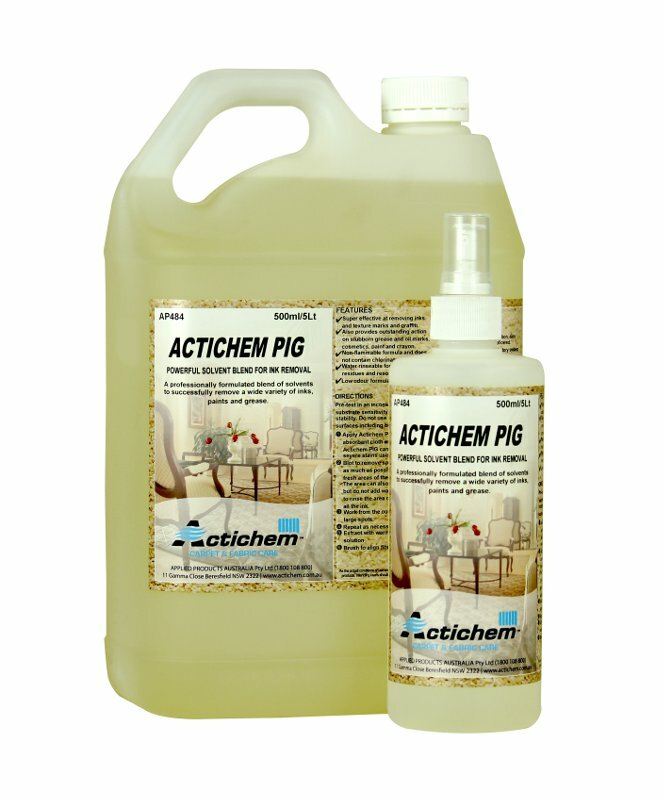 Also formulated for use as an effective cleaning booster in pre-spray solution for heavily soiled carpets. It removes oil or water based paints, cosmetics, grease, oily spots, adhesives and most inks. 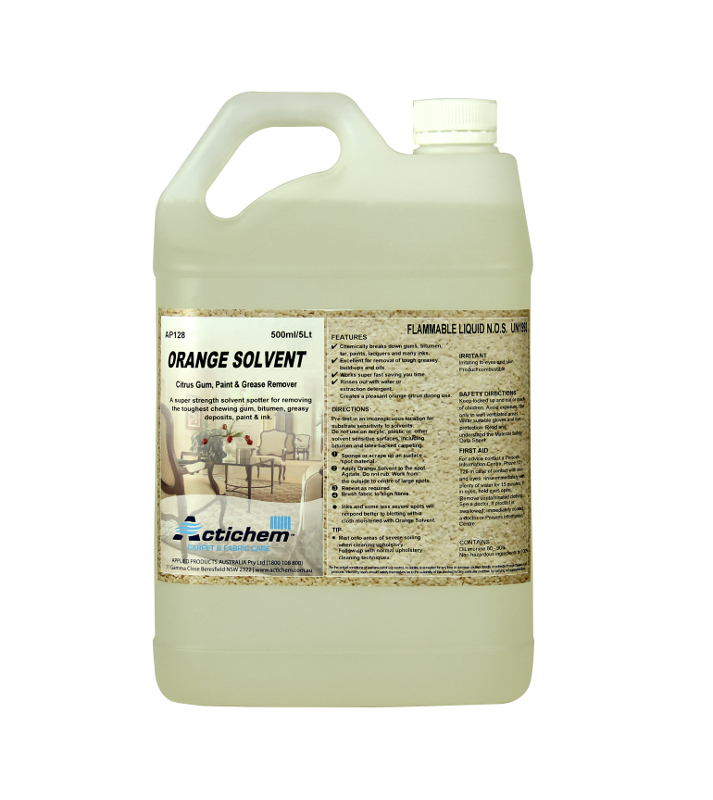 It has a high performance water rinseable blend of solvents and detergents. It is non-flammable, low VOC's and easy to use. Available in 500 ml, 5 and 20 litres. Actichem Gum Gone - radical strength gum, paint and grease remover. 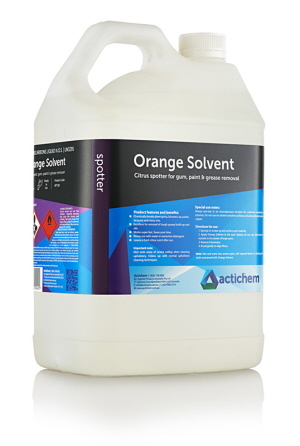 A super strength solvent spotter for removing the toughest chewing gum, bitumen, greasy deposits, paint and ink. It is excellent for removal of tough greasy build-ups and oils.It works super fast saving your time. It rinses out with water or extraction detergent. Available in 500ml, 5 and 20 litres. 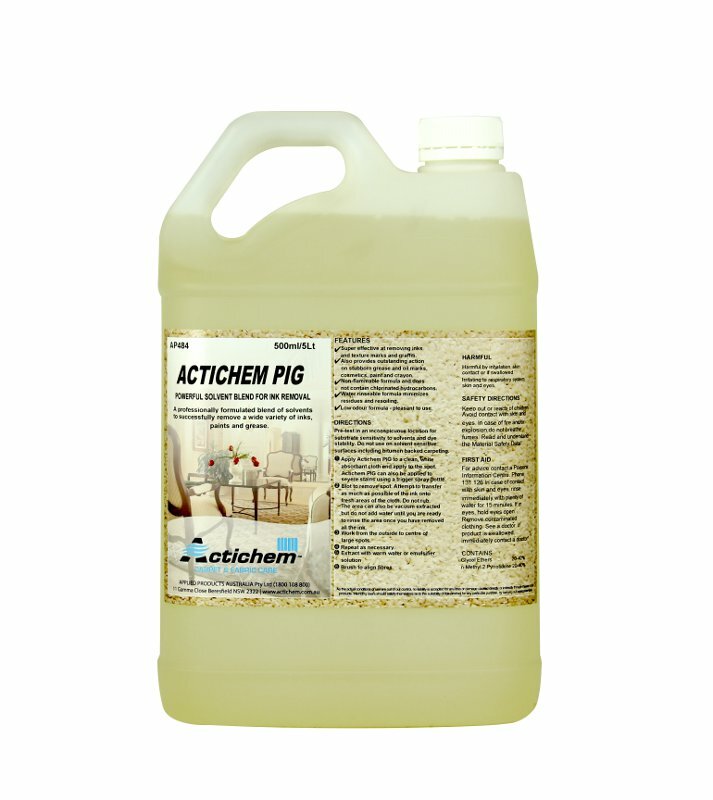 Actichem PIG is a powerful solvent blend for the removal of ink spots; solvent based paints and grease on carpets and hard surfaces. It is super effective at removing inks and texture marks and grafitti. 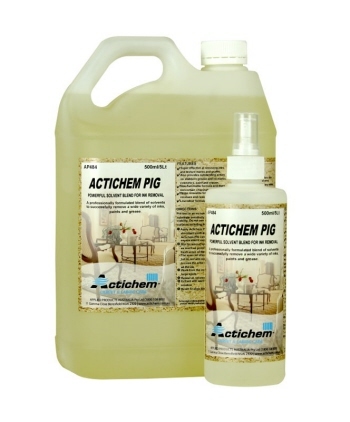 It also provides outstanding action on stubborn grease and oil marks, cosmetics, paint and crayon. It has low odour formula. 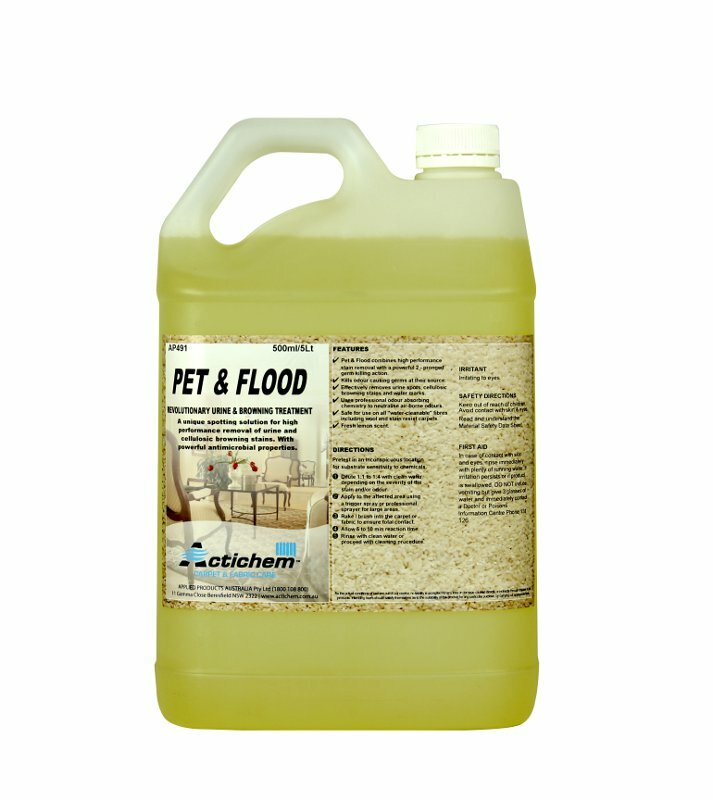 Water rinseable formula minimizes residues and resoiling. It has non-flammable formula and does not contain chlorinated hydrocarbons. Available in 500ml, 5 and 20 litres. 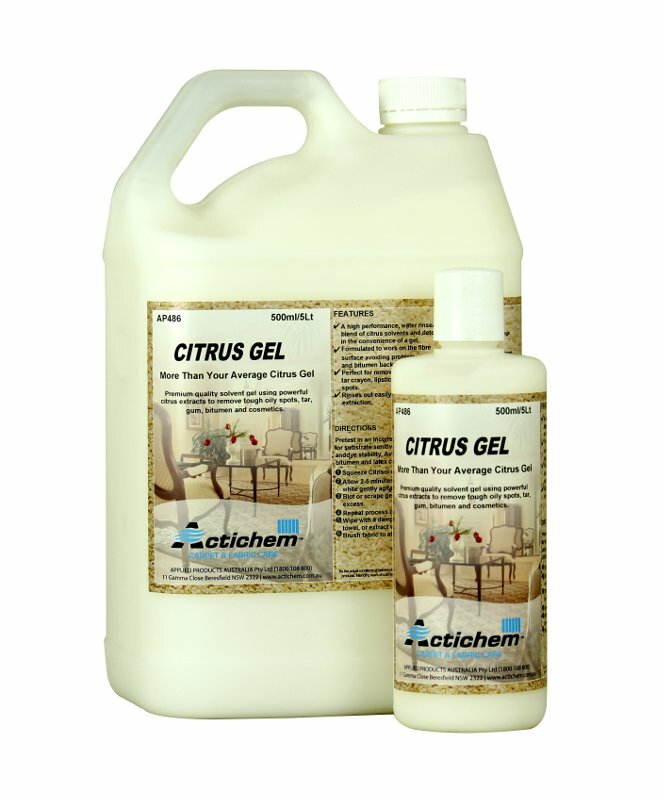 Actichem Citrus Gel is a high performance citrus gel. Premium quality solvent gel using powerful citrus extracts, to remove tough oily spots, tar, gum, bitumen & cosmetics. 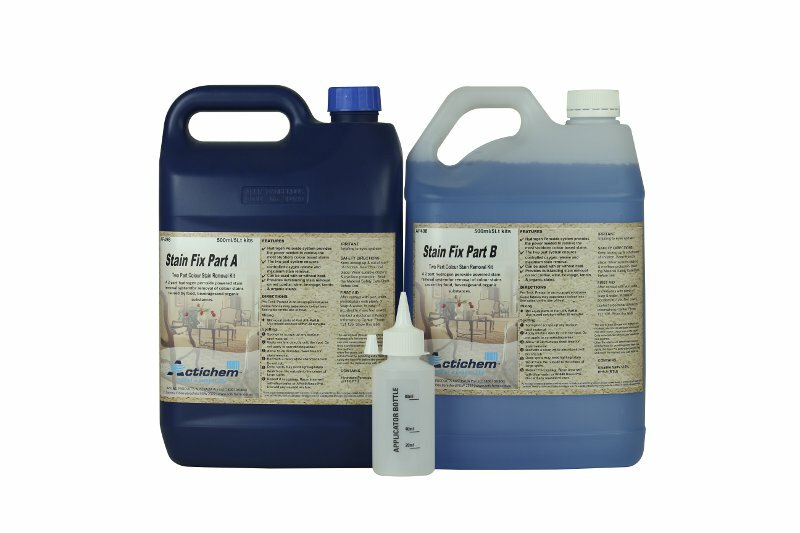 It's stable gel formula enables it to stay on the spot longer instead of running down to the base of the carpet. Ideal for gums, putty, bitumen, tar and heavy grease deposits. 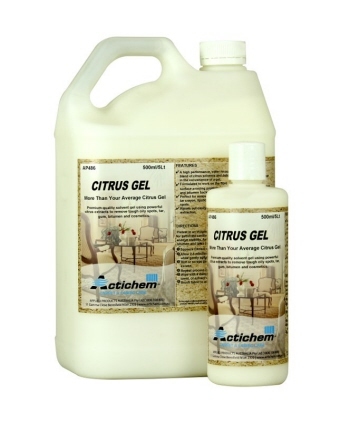 A highly effective, blend of citrus solvents and emulsifiers in the convenience of a gel. It’s cream/gel consistency makes it easy to work with. 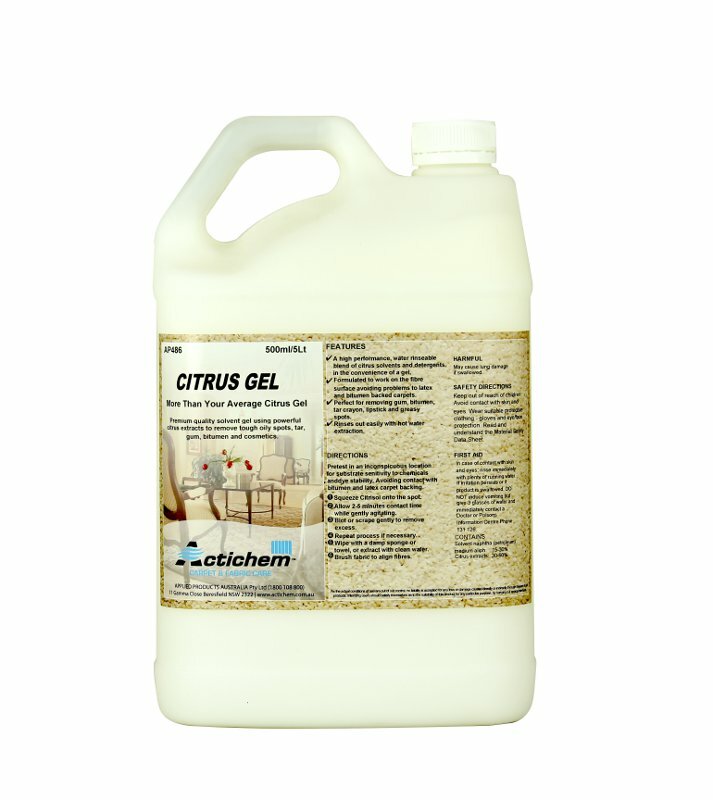 Citrisol is excellent for low odour cleaning leaving behind a fresh citrus sent. It is formulated to work on the fibre surface avoid ing problems to latex and bitumen backed carpets. It rinses out easily with hot water extraction. Available in 500ml and 5 litres. Actichem CTR is a specially formulated acidic spotter for tea, coffee, tannin, beer, water marks and coloured beverages. It works fast and safely on almost all fibres and fabrics. It rinses quickly with water. It provides outstanding cellulosic browning removal. Available in 500ml, 5 and 20 litres. 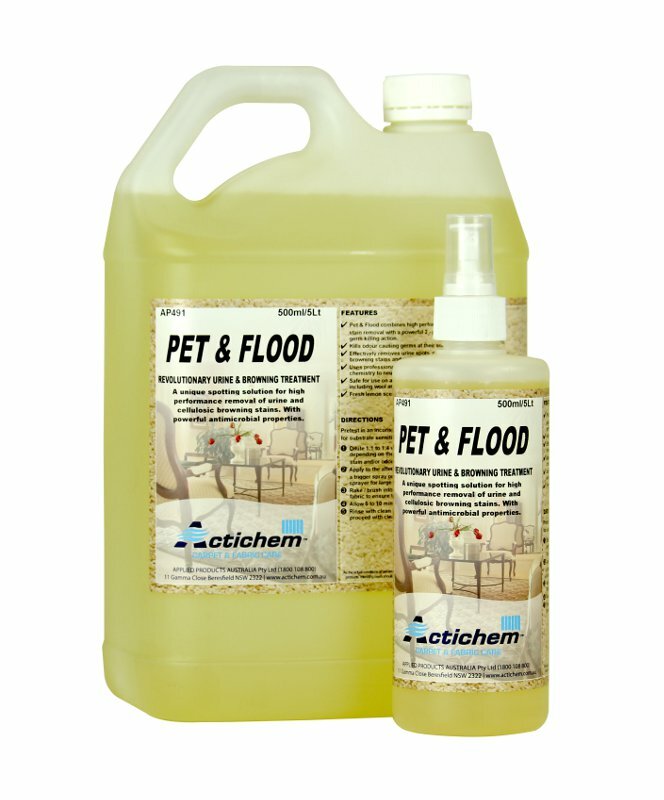 Actichem's Pet n' Flood is a unique spotting solution for high-performance removal of urine and cellulosic browning stains. With powerful anti-microbial properties. 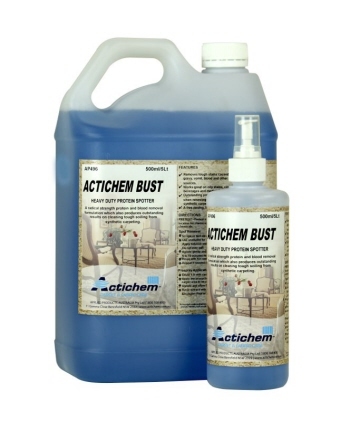 It combines high performance stain removal with a powerful 2-pronged germ killing action. It kills odour causing germs at their source. It uses professional odour absorbing chemistry to neutralise air-borne odours. 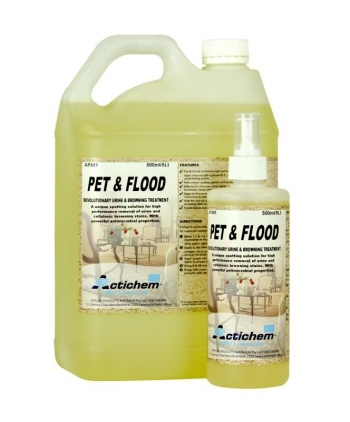 It is safe for use on all "water-cleanable"fibres including wool and stain resist carpets. It has fresh lemon scent. Available in 500ml, 5 and 20 litres. 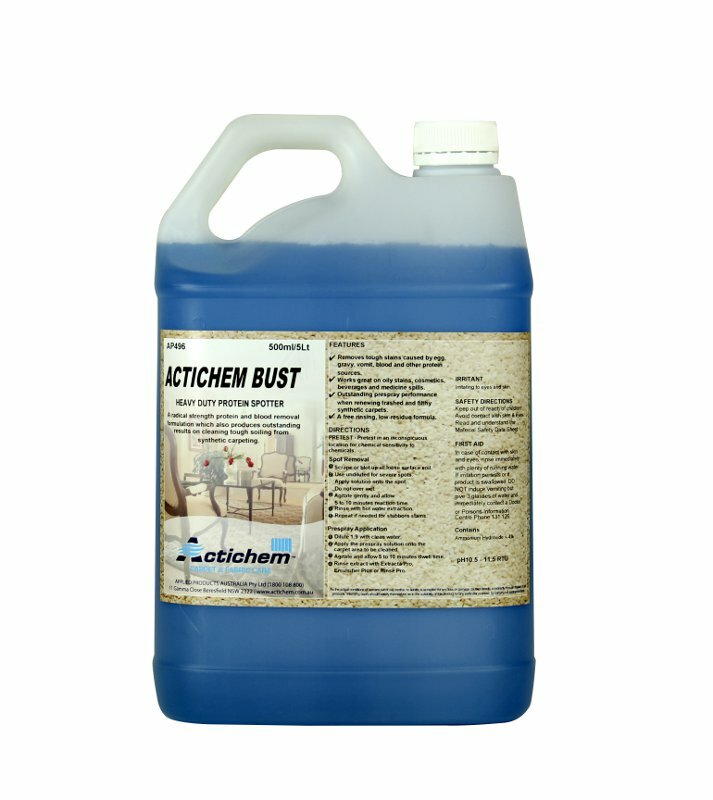 Actichem High performance rust spot remover. Safe to use! Acidic liquid for permanent removal of rust spots and dry blood stains. It replaces the traditional use of Hydrofluoric Acid which has a high hazard profile and is extremely corrosive. This professionally researched formula includes a special blend of wetting agents which enables fast and efficient chemical action on deep-set spots. 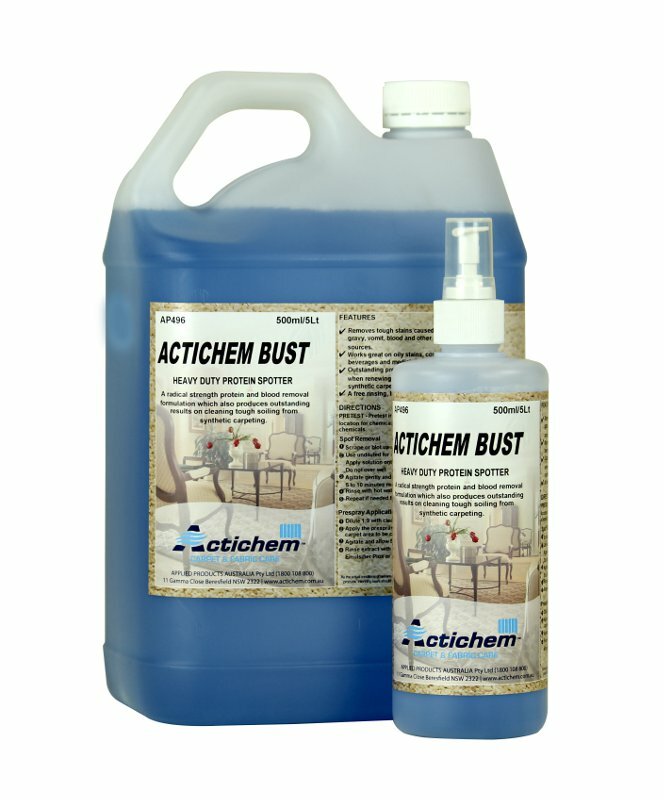 Actichem's Rust Remover’s innovative chemistry is also very effective for removing old, dried blood spots. Pretesting is always required. It is safe for use on all natural and synthetic fibres, however fine fabrics must be pre-tested for colour stability before use. Specialty low odour formula ensures user comfort. You may use spray bottle for easy use. Available in 500ml, 5 and 20 litres. 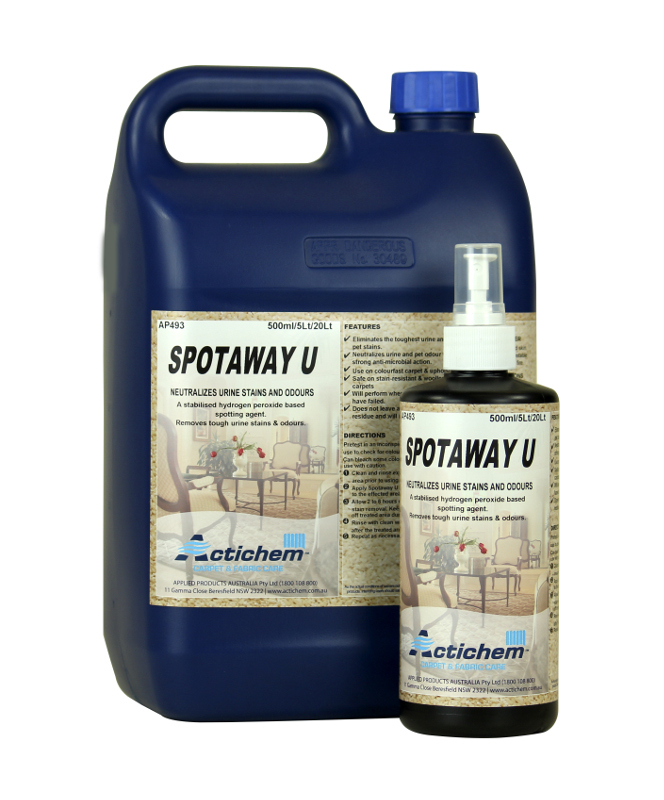 Actichem Spotaway U removes tough urine stains and odours. 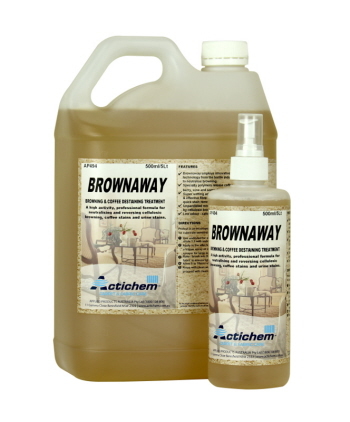 This is a stabilized Hydrogen peroxide based spotting agent for powerful urine crystal and stain removal. 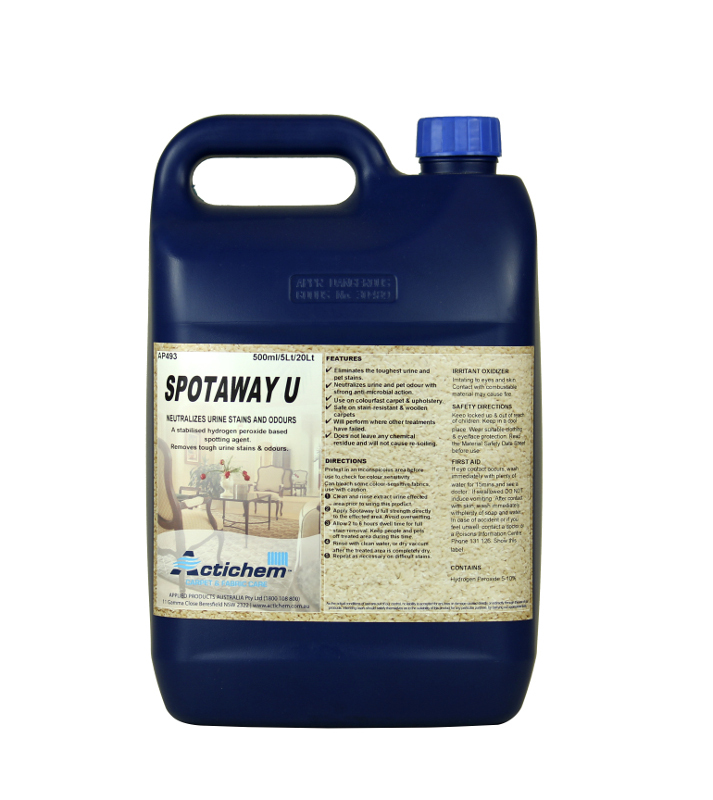 Use Spotaway U from Actichem where other treatments have failed. Some older, stubborn urine stains will only respond to the powerful Hydrogen Peroxide neutralization treatment. It leaves absolutely no residues behind and does not need to be rinsed. It is safe for use on colourfast fabrics and carpets. It is save for urse on natural and synthetic fibres, however, fine fabrics must be pretested for fibre and colour stability before use. 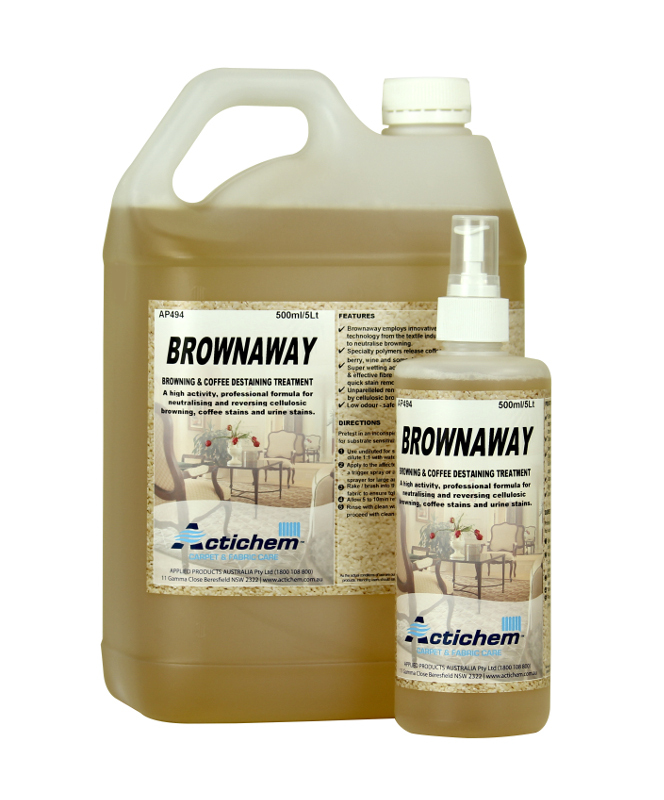 Actichem Brownaway is a high activity, professional formula for neutralizing and reversing cellulosic browning, coffee stains and urine stains. It has a mild fragrance.This professionally researched formula includes a special blend of low pH compounds proven to permanently remove tough browning discolourations, water marks, coffee stains, urine stains and many dye stains. 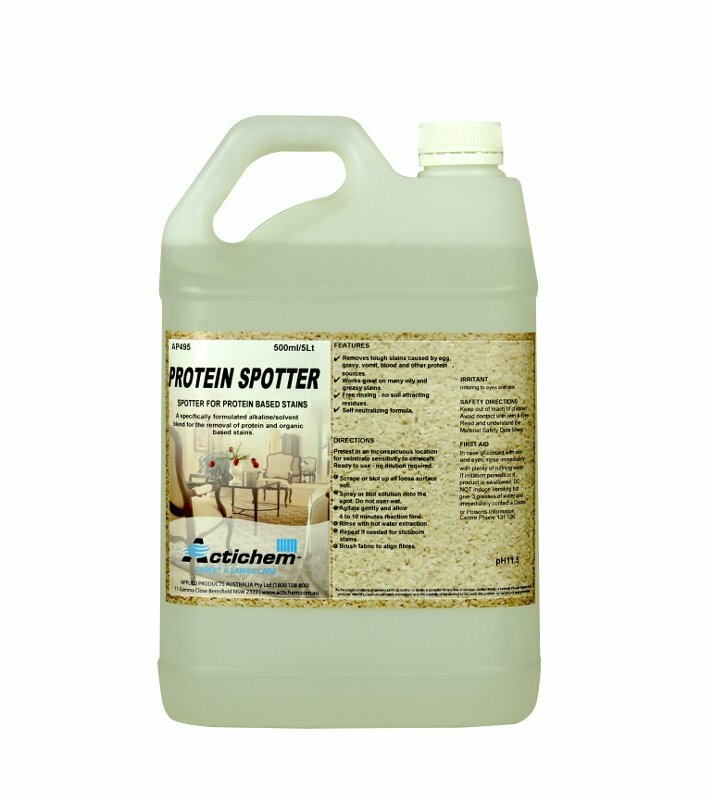 Actichem Spotter is a professionally formulated alkaline/ solvent blend for the removal of protein and organic based stains. 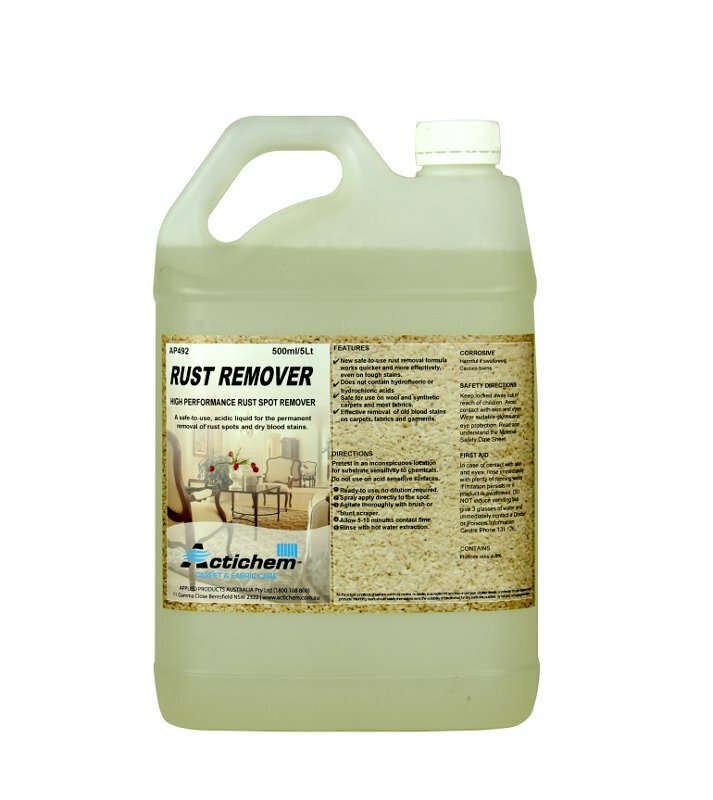 It is ideal in removing a wide variety of organic stains such as food, gravy, beverages and blood from carpets. 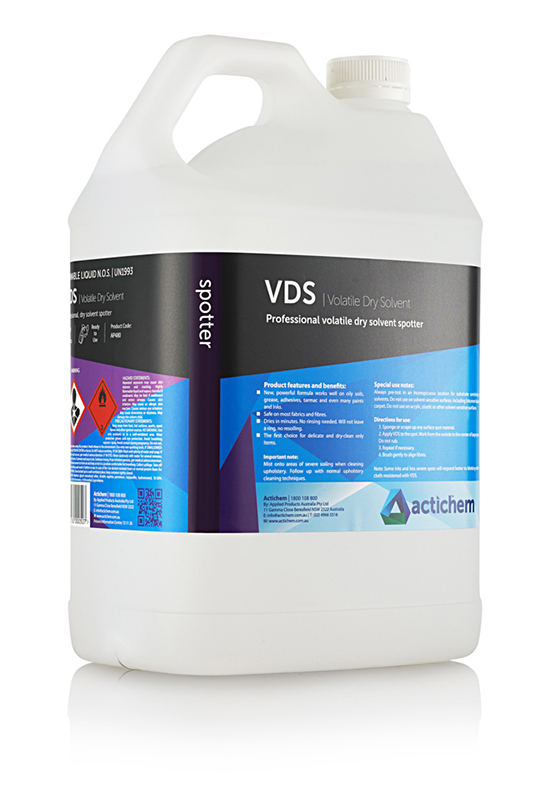 It combines powerful protein dissolving chemistry with wetting and penetrating technology for dissolving protein soils and releasing them from fibres and fabrics. 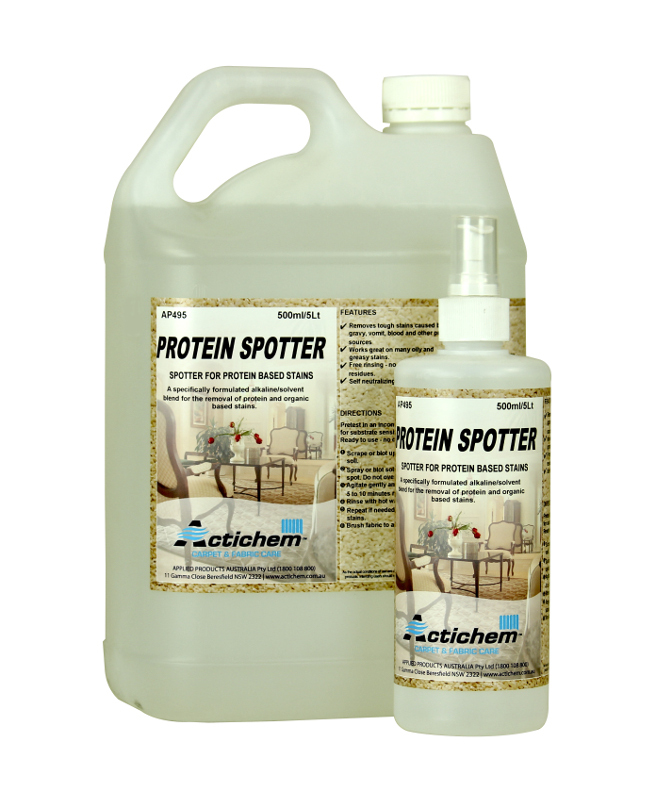 Actichem Bust is a heavy duty protein spotter. 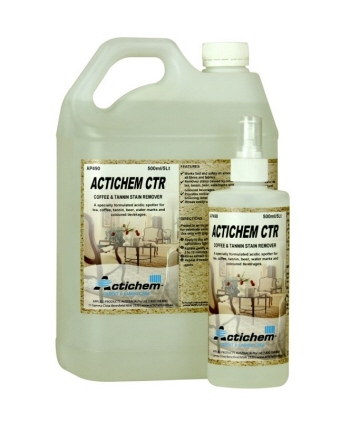 It has a radical strength protein and blood removal formulation which also produces outstanding results on cleaning tough soiling from synthetic carpeting. It removes stains caused by egg, gravy, milk, blood, vomit and other protein sources. It works on oily stains, cosmetics, beverages and medicine spills. Outstanding prespray performance when renewing trashed and filthy synthetic carpets. A free rinsing, low-residue formula. 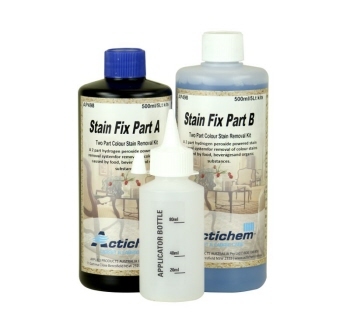 Two part colour stain removal kit. Actichem’s AP49 8 Stain Fix is a powerful stain removal system for the removal of colour stains caused by cool drinks, wine, food, beverages and organic substances. The two part system allows the controlled use of activated hydrogen peroxide which creates radical strength stain removal properties in a short space of time. The two part system ensures maximum peroxide performance for the most stubborn stains. It is safe for use on colourfast fabrics and carpets, although pretesting should always be done to ensure colour stability. It is also safe for use on natural and synthetic fibres, however fine fabrics must be pre-tested for fibre stability before use. Available in 500ml, and 5 litres kit. 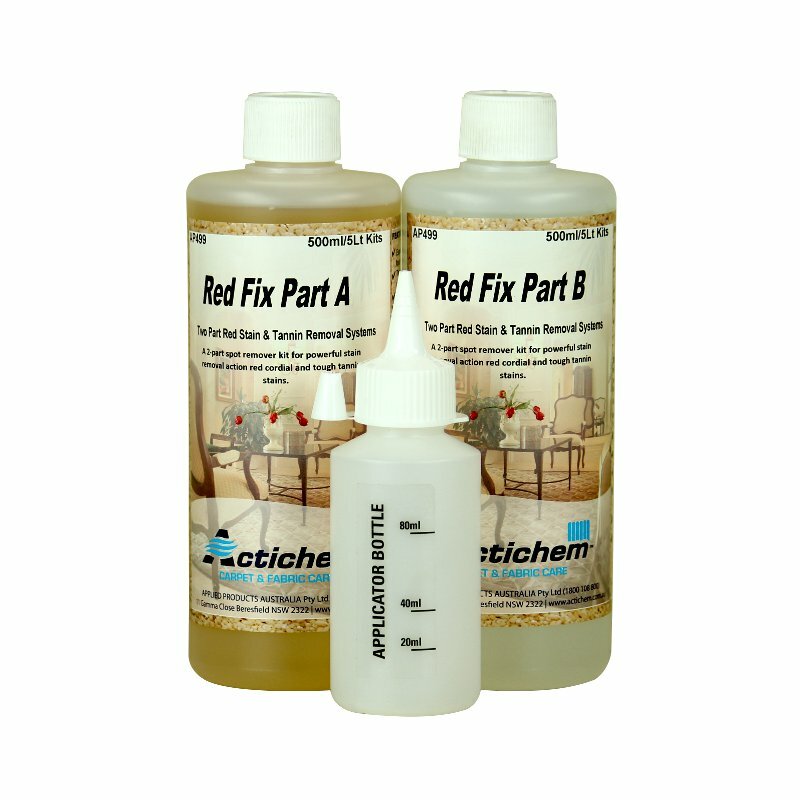 Actichem Red Fix KIT 2 Part Stain Remover is a two part red stain & tannin removal kit. 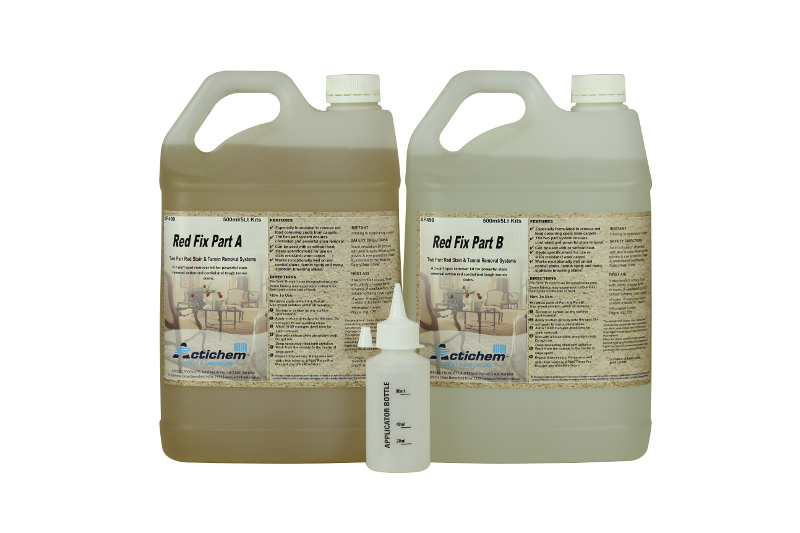 2 part spot remover kit for powerful stain removal, from red cordial; wine and other tough tannin spots. Available in 500ml and 5 litres kit.